Shazam® believes the tunes we’ll be listening to the most this summer will come from Ed Sheeran, Ariana Grande, and Sam Smith. The music app’s one of the “most accurate predictive measures of future hits” and Shazam’s 2013 summer hit prediction list included Robin Thicke’s “Blurred Lines”, Daft Punk’s “Get Lucky,” and Passenger’s “Let Her Go.” The previous year, Shazam predicted Gotye’s “Somebody I Used to Know” and Maroon 5’s “Payphone” would be among the summer of 2012’s most popular hits. 2. Ariana Grande Feat. Iggy Azalea – “Problem.” Iggy Azalea is perhaps the hottest rapper of the moment and this collaboration is proving to be huge with Shazam users. 3. Sam Smith – “Stay With Me.” Sam is currently riding high in the US as a guest vocalist for Naughty Boy and Disclosure. To date Sam Smith’s vocals have been Shazamed over 15 million times with this single rising dramatically week on week. 4. Luke Bryan – “Play It Again.” “Play It Again” is the undoubted country hit of the year. 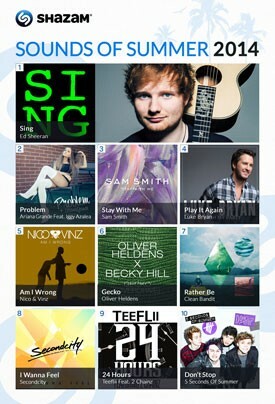 Currently number one in Shazam’s Country chart expect this to be getting love till winter time. 5. Nico & Vinz – “Am I Wrong.” Norwegians Nico & Vinz have had huge success in Europe with “Am I Wrong”. The trajectory of the track in the USA is going steeply upward. 6. Oliver Heldens – “Gecko.” From the label that brought the world Martin Garrix comes Oliver Heldens: the latest Euro-house sensation. The new vocal version of “Gecko” seems to be taking this underground hit over-ground. 7. Clean Bandit – “Rather Be.” “Rather Be” broke Shazam and sales records when it dropped in Europe. To date it’s been Shazamed nearly 10 million times. It’s still the most Shazamed track in the world but could go even bigger with more US radio play. Clean Bandit’s follow up, “Extraordinary”, also shows the band may have more than just one tune in their locker too. 8. Secondcity – “I Wanna Feel.” This dance track is one of the most reactive tracks in the UK and almost certain to be a number one when released on 25th May. There’s a great chance this could go big in Europe with the Ibiza season fast approaching. 9. Teeflii Feat. 2 Chainz – “24 Hours.” Teeflii is one of the most exciting underground R&B singers. This beat is produced by the unstoppable DJ Mustard and features the always popular 2 Chainz. It hasn’t even released officially but has already been Shazamed 100K times! 10. 5 Seconds Of Summer – “Don’t Stop.” This Australian band has shown explosive growth on Shazam and social media. They’re tipped to have the One Direction levels of success this year and the signs are this track could help them get there.